Garrett Debbink is a Choir teacher and director from Madison, Wisconsin. 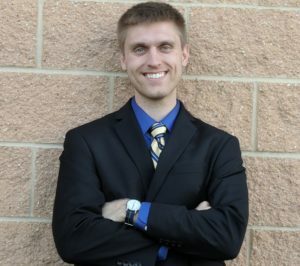 He received his Bachelor’s of Music Education from the University of Wisconsin – Eau Claire in 2012, before working at Jefferson Middle School in the Madison Metropolitan School District where he teaches Choir and General Music. In the past, Garrett has enjoyed singing in many different choral and instrumental ensembles, from marching band to barbershop to a cappella. In 2015, Garrett started directing the Madison Maennerchor, a German Men’s Choir in Madison, leading the choir to a top ranking in the annual Kommers for the Wisconsin Saengerbezirk. He has actively sought to increase the choir’s size by incorporating new concert ideas and events. Garrett regularly arranges music for his choirs as well as others, and is currently working on his Master’s of Education through the University of Wisconsin – Eau Claire.